The mayor, though, has continued to talk up one transportation proposal: congestion pricing. Often called “decongestion pricing” by advocates who want to clarify its goal, the policy charges car drivers to enter central city areas, with higher charges during the most crowded hours. (Other policies such as HOT lanes and variable bridge/tunnel tolls are also forms of congestion pricing, but aren’t what the mayor is proposing.) Central city congestion pricing has been implemented in London, Singapore, and Stockholm, but nowhere in the United States to date. Among U.S. cities, only New York has seriously considered it, so far without action. While the city remains in the early stages of designing a proposal, Seattle’s congestion pricing areas would likely include downtown, Belltown, the Denny Triangle, South Lake Union, and parts of First Hill—that is, most of the city’s largest job centers. Both private and rideshare cars would be charged. Peak-hour commuters accessing those areas by car would pay significantly more than they do today, while the charges would not affect commuters arriving by transit, bike, or foot. For those who are able to use non-car modes, the program would provide an excellent incentive to use those modes more of the time. If it’s high enough, the charge should reduce congestion and delays for drivers, including both commuters and delivery drivers. There’s always a catch to policy solutions, and the catch with congestion pricing is that its impact would fall hardest on lower- and middle-income commuters from far-flung areas that are not well-served by transit. As housing in the city rapidly becomes more expensive, that category includes an increasing number of the central city’s service and clerical workers. There are a variety of solutions proposed to address the impact, including rebates or discounts for lower-income drivers; employer-based subsidies similar to those currently offered for transit passes; and programs to help employers change employees’ hours so they commute at less congested, less expensive times. But these are not ideal. The first two dampen the effectiveness of congestion pricing by allowing more drivers to bypass it, while the last may have undesired effects on employer productivity and employees’ personal lives. The best, least harmful solution is to make it easy for as many workers as possible to use transit. London, Stockholm, and Singapore all have world-class comprehensive transit systems. Even so, London devoted the entirety of revenues from its congestion charge to further improvement of the city’s transport network, funding major subway, rail, and bus improvements, together with a new network of bike facilities. Stockholm also initially invested the entirety of revenues in transit, but was then forced to shift revenue to roads by a political revolt in the suburbs and exurbs. By contrast, Seattle’s system is still in early stages of growth. Sound Transit will bring grade-separated transit to many core communities over the next two decades. But many areas will continue relying on bus connections to access the rail network, while others will use buses exclusively. Still more areas—often those with the most reasonable housing prices—aren’t served by transit at all. By the high standards of the cities that have congestion pricing, our buses are infrequent, unreliable, and often slow. If congestion pricing is implemented with the current transit network, many of our workers won’t have the options that are available to communities in London or Singapore. Congestion pricing should go hand-in-hand with major improvements in the transit network, especially the bus network. Revenues should fund improvements throughout the region in the mold of those initially planned for RapidRide+: dedicated streetcar/bus lanes (including at major intersections), off-board fare collection, transit priority streets within the congestion area, improved frequency, and longer hours of service. Without better transit, the congestion charge begins to look less like an attempt to help everyone get around faster, and more like a device to reserve street space for the wealthiest drivers. Mayor Durkan should fight that perception by demonstrating a new commitment to real transit improvements starting today, and then by including larger improvements as a foundational part of the congestion pricing proposal she eventually issues. This seems to defeat the purpose; it’s really no different than employer-purchased parking spaces in it just encourages employees to drive since they bear no direct costs. Or put another way, it just makes it more expensive for an employer to retain an employee that drives to work. Park and rides could be part of the solution if they are appropriately managed so that spaces are available for those that really need them, rather than those simply too lazy to walk three blocks. It is not possible to get to Seattle from outside the city without passing right by a park and ride with express bus service to downtown. So, even those that live far away, where there is no public transportation can’t really say they have no choice but to drive all the way downtown with a straight face. We should only build new spots (generally $20,000 – $50,000 per spot if they can collect rent on the space. The charge should be less than the congestion toll price. If that level isn’t enough to cover construction bonds, then the spaces should not be built. In fairness, I think that the mayor’s pause on projects is significantly due to low cost estimating. Low cost estimates and low contingencies are not her fault! We forget how we no one questioned the costs in the past — or they looked like a hater. I’m glad to see leaders who are willing to be more of a parent and tell whiny kids at the candy store that the candy is much more expensive than planned and that not buying it doesn’t mean that they hate candy or the kid. Well … maybe it is more nutritious than candy but a fair assessment that accounts for the new cost and for new benefits is appropriate. I agree. Speaking as one of such individuals, we were and are around! We questioned the cost estimates for ST2 and ST3, for example, but were seldom heard or, as you say, simply considered a transit “hater”. I agree with both of you. At this point she seems like a no-nonsense, no BS mayor. Good for her. We’ve had so many projects in this town that were just ridiculous. Some never got built and others weren’t close to what was originally promised. Remember the monorail (the new one)? How about the SR 99 tunnel? No one knows who will pay for the overruns, but what we do know is that it won’t be anything like the original proposal. Only two lanes and no ramps for Western — won’t that be great for traffic. Both streetcars were stupid, and the second one (supposedly built to make up for Link skipping First Hill) is so unpopular that the merchants don’t even want to extend it a few blocks to the north. They probably would have been better off without it, so that a First Hill station could have been included in ST3 (since, you know, you can’t count on Sound Transit building things the way every other major city has). Transit advocates have to realize that there is no blank check. If you build something stupid (or just too expensive), you might not get what actually makes sense for your town or your neighborhood. For all we know that is happening to Everett as we speak. Oh, and do you really think it is a great idea to make major transportation decisions without a long term head of your transportation department? Does anyone think the last guy left the organization running in tip-top shape? Cut her some slack. Yes, many of these delays are annoying, and some of them may be misguided. But most of the transportation problems that will occur over the next year or two have nothing to with her, and everything to do with stupid decisions made by previous mayors and current leaders. Build a SR 99 tunnel without ramps for Western, and not allocate a dime for transit: Check. Kick the buses out of the tunnel early, so you can build an unnecessarily large convention center: Check. Build a streetcar line that is laughingly horrible — a textbook example of how *not* to build any transit line: Check. Oh, and the mode for this ridiculous line manages to piss off bike riders and transit advocates at the same time! They even proposed a plan for NE 65th — just one street! — that is so bad that a high school kid can propose something better. SDOT was in such a mess that the Director of Transit & Mobility at SDOT couldn’t respond to an important message from Metro about how much it would cost to actually run the streetcars. Good God, how does the Director of Transit & Mobility at SDOT not pick up the phone when Metro calls?!! Holy cow, he should have a red phone or a beeper — but he couldn’t bother with returning the call. The point is that SDOT — as far as transit goes — is a mess. Yes, they’ve done a few good things. Great. But overall, they are a mess, and the mayor has probably figured that out. So now, while she searches for a new head of SDOT half as good as the new police chief, she is moving slow. Good for her. Right now you’re writing campaign commercials for Steve O’Ban and Dino (long “i”) Rossi. Only they won’t fund more buses, they’ll just defund Sound Transit. Ross, it’s time for you to run for office or take up Yoga. Does nothing ever please you? Jeesh, maybe you should calm down, stopping attacking people, and actually read what they say. Holy cow, I write a long, four paragraph essay *defending the mayor* and you wonder if nothing ever pleases me? Don’t you get it? Do I have to spell it out for you — should I break out the puppets? The mayor pleases me. Sure, I don’t think she is perfect, but so far, I think she is doing an outstanding job. She has appointed an outstanding police chief, which is arguably the most important part of her job. How the hell does she find someone that pleases *both* the rank and file *and* those interested in police reform is beyond me. But the mayor appointed her, and the city will be much better for it. More to the point, what pleases you? Are you pleased about the current streetcar route, which includes a senseless button hook? Are you pleased with the way the current Director of Transit & Mobility at SDOT managed to derail the streetcar project with his incompetence? Are you pleased with the way they passed a huge, important funding proposal that included some money for transit, but promised way more than what they could deliver? Are you pleased with the design of streets like 65th NE, which inexplicably — I mean literally inexplicably (SDOT can’t find a rational for their decision) — make it tougher for buses to operate while increasing crowding on the streets? What pleases you in this town? The Madison BRT? Yeah, sure, join the club (that project pleases me quite a bit). That is a small list, isn’t it. Oh, and comparing me to Dino Rossi? Holy smoke, the guy who opposes a First Hill station and opposes a bridge to Ballard so much that he is willing to end the line at Interbay has the audacity to compare me to anti-transit politicians. Dude, you just don’t get it. Sometimes it is worth spending money to get something of extra value (like running a line from Ballard to the UW, or adding a station in First Hill), sometimes it isn’t (like tunneling under the ship canal again, or running a tiny streetcar on a terrible route). Neither makes us right wing extremists, it just means some have a clue about high value when it comes to transit. That comment about being called a general “transit hater” akin to fiercely anti-transit people just because someone doesn’t say every transit project is a good idea even when it turns out to be much costlier and less practical than first advocated. That still doesn’t explain her refusal to meet with the pro-CCC advocates. What would meeting with them accomplish? Listening to them, engaging with them to find common solutions.That partnership thing. She has made it clear — over and over — that she won’t make a decision until the study is finished. What is the point of meeting with someone when you don’t have all the data or even a list of alternatives? Seriously, what would they talk about, the weather? The Mariners? Given the reality of our transportation mess, can transit really be considered a “luxury” like “candy in a candy store?” What the Mayor is doing is more like cutting bread and butter (e.g., bringing things to reasonably usable levels: basic bike network, sidewalks, Rapid Ride) while continuing to splurge on candy (Lander St. bridge–a usable car/truck crossing already existed). Let’s be clear that the CCC is in fact more of a “luxury” than many other possible transit strategies and needs. It’s mostly redundant. We already have a much faster DSTT just under 500 feet away from First Avenue with proposed 3-minute to 5-minute service by 2023, as well as a bus almost every minute or two on the surface at Third Avenue — both of which connect further to other places than just Downtown. Sure it’s a hassle to use the DSTT, but shifting the streetcar money to pay for better escalators (including new down escalators) and better entrances towards First Avenue or a series of escalators to better connect the Ferry terminal with Link would seem much more cost-effective than overlaying a redundant, slower, less frequent streetcar. If that wasn’t the case, why didn’t Metro or ST lead the CCC streetcar effort in the first place? The Lander Street Bridge is supposed to improve freight movement, which strengthens our industrial job base. That’s important too. Not to mention that the Lander Street bridge a project that appears to be budgeted correctly — and it’s funding issues were apparently resolved with Port funds. There appears to still be $33M of City funds in the project ($20M from Move Seattle) as was promised two years ago. The Seattle mentality is usually to embrace a project idea first and collect money to pay for it after that. Congestion pricing probably won’t happen until a more specific set of projects is identified. After the recent cost problems with Move Seattle program, the public is probably more sensitive to that now more than any time in the recent past. I even wonder if this congestion pricing chat is a bit of a utopian distraction without more definitive outcomes from doing it. My mother-in-law goes three times a week for dialysis on First Hill. She doesn’t drive, so it’s two tolls for each appointment (drop off, pick up) and six for the week. It’s not just middle-class commuters who would be paying the congestion price, or decongestion price. It also includes lots of low-income and senior citizens just trying to get by. Market based solutions will penalize those without money. This is contra the mission of a city, which should be for everyone. Congestion pricing should be a stick, with the carrot being a frequent, fast, and reliable mass transit system. People without money don’t drive downtown. Look, market based solutions work. We are all familiar with fines, even though they are in no way fair (at least in this country). Someone who is wealthy may just ignore that ticket. Someone who is poor will be hit hard by it. But overall, a ticket for say, driving too fast in a school zone, really does reduce the amount of speeding. Just recently, there was a report released about the congestion effects of Lyft and Uber. It turns out it really isn’t used in the most optimal way. There are a handful of people who use it to solve that last mile problem, but that is dwarfed by the number of people who use it *as an alternative* to transit. They don’t want to wait for a bus, so they use Uber. But why didn’t they call a cab a few years ago? Why don’t they just drive and park? Because it cost too much! There is a strong correspondence between destinations that charge a lot for parking and ride sharing. If those ride sharing options get too expensive (and parking remains expensive) people take transit. The same is true with the HOT tolls. Every day, lots of regular, working class people pay money to ride in those lanes. If you are late to pick up your kid at day care, it costs a fortune. So when there is an accident on the freeway, or your meeting ran late, you pay the state to ride in that lane. But thousands of other people — people who can afford it — just slog it out in the regular lanes. No, a toll is not a perfect tool, but it is simple and a lot better that what we have now. Last time I checked it cost money to get on a bus or ride the train — why should it be free to drive downtown? It bothers me how people have this double standard where people driving their own cars (or get picked up and dropped off by family for free) are more entitled to use to the road space than people paying others to drive them. This is the people who say “cap Uber to fight congestion downtown” and leave unsaid “so I can drive my car there faster”. At the end of the day, a car is a car, and whether your being transported by an Uber driver or your mother, the amount of congestion the car is causing is the same, and should be taxed (if at all) the same. The knee jerk reaction of course, is for people to remember the good old days when Seattle was much smaller and people could drive through downtown all the wanted, at any time of day, with minimal delay – then, look for something new that’s easy to blame, so that someone else (e.g. Uber passengers) not them (car drivers) bear the cost. This is essentially what SeaTac airport does (as do many other airports). People who pay somebody to drive them home have to pay a surcharge for use of the pick-up facility. But, for people fortunate enough to have friends or family willing to drive out to the airport to take them home, the use of the pick-up facility is given away, free of charge. I would again argue, this isn’t fair. There is definitely enough congestion in the SeaTac pick-up area to justify congestion pricing, but every car that causes congestion should have to pay – not just Uber and Lyft cars. 1) It is easy. No need to add tolls everywhere or put new transponders on every car. Both Lift and Uber know exactly where every car is. 2) Taking Lyft or Uber is likely to respond to price pressures. Lyft and Uber are both cheap and convenient. That is why they are popular. In contrast, parking your own car downtown is convenient but already expensive. Charge a little more and folks will grumble about it, but most will still drive. In contrast, dropping someone off is cheap, and likely only done when it is really easy and convenient. Again, that is unlikely to respond to price pressure. Yet we know — based on the studies — that a substantial portion of the Lyft/Uber rides are taken to downtown locations by people who don’t want to bother with the cost of parking and find the Uber/Lift quite cheap. But if you charge a bit more, then it becomes like the old taxis (convenient but expensive) and folks find other ways to get there (i. e. they take transit). That doesn’t mean it is fair, but so what? We have similar fees now. For example, food is not taxed, because food is considered a necessity. But why then, don’t we tax candy? For that matter, why do we tax soda pop, but not candy? All taxes and all fees have to consider the complexity as well other factors. Taxing taxi-cabs (for trips taken downtown) would likely be effective and simple, even if it would be less than ideal. Let’s be crystal clear: the areas in Seattle which currently aren’t served by frequent all-day transit are the areas of the city which do not want it. No transit means the rabble stays away. So, the only low-income folks discomfited by congestion tolling downtown are people who live in the suburbs but have service jobs downtown. They don’t vote in Seattle so their political opposition should not matter. Nor should the political opposition of autoistas from the ‘burbs. In fact, they should be paying the highest tolls of all, because they benefit from the City’s ability to attract high-paying jobs and make no contribution to the City’s finances. Well, yes, sales taxes on their lunches. 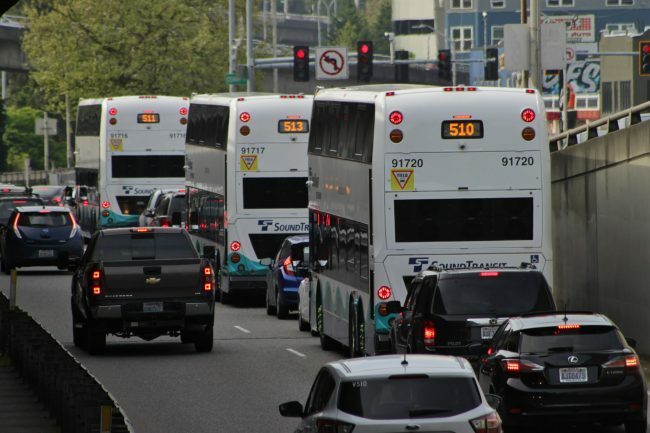 So, should the City embark on this project, a good part of the revenues should go to adding peak hour service to downtown for in-City lines and adding all-day, early morning and evening service to the most important trunk lines to South King County. The City can’t subsidize “coverage” routes throughout the County; there are simply too many miles of low-volume arterials snaking everywhere to do that. People who by choice or necessity live in sparsely populated areas will have to drive to some parking facility and take transit if they can’t afford the tolls. That’s hard on them, but it is really not Seattle’s responsibility to provide them coverage transit. The mayor supports congestion pricing because it will make her life easier as well as others that like to use cars to get around and don’t care about paying a toll. It leads to a future where wealthy people will use cars and the rest of us will be stuck on underfunded transit. The true market-based solution is red paint and lots of it. It’s already being done and can continue to be done incrementally. It’s not as vulnerable to the “Seattle Process”. It quickly pays for itself. It doesn’t take years and tens of millions to implement. That said, I do support some automatic “tolling” on bus-only lanes. On the West Seattle Bridge a “good to go” reader could easily mail a $100 “toll” to any car using the bus lane. Way easier than having a cop enforce the lane. Joe, “Good To Go” clinches the whole thing. But since we’re on the subject of city employees’ job descriptions (come on, pretend like it!) is this re-make of Third and necessary arterials something the Seattle City Council can do by itself? Since Mayor Durkan isn’t on my payroll right now, any communication of mine would line the bottom of the City Hall dumpster. So this is for the transit voters whose shreds they can use for a blanket. Congestion Pricing, parking, budget estimates, and the other shreds- sift them later. Right now you’ve got the Mayor of your city beginning her term with a flat refusal to level with the people who elected her. On a matter she considers serious enough to justify so much effort. And also justifies her summary impeachment next time she refuses either to release it or give you some compelling reasons why she can’t. Tell me, anyone in criminal law: is this the way a prosecuting attorney will often deal with a matter her former colleagues are just about ready to press charges on? If she’s justified, her voters deserve a one-sentence explanation. Live and in person. If she won’t, Seattle deserves another Mayor. Though Jennie at least deserves somebody better for a successor. Name? Glad that’s your job and not mine. Is the framing of the issues facing Mayor Durkan objective? Does not proceeding with the CCC Streetcar and its issues pit one transit mode against other transit modes? Does not delaying the two-way cycle track on 4th Avenue preserve transit flow? did not the deputy mayor meet with the CCC proponents? Glad you’re here , eddiew, because I think you’ve got some career experience really valuable right now. I won’t touch whether bike vs. buses is a mode-split pit. Still won’t pet one of those dogs without an introduction. But I’ll agree with you about some of the reaction to the Mayor’s handling of CCC. In line-haul transit, a Slow Order isn’t a cancellation. Let alone a statement of mode preferences. But SDOT’s cheerleader-on- Prozac mention of “Bus Bulbs” without a word on transit-reserved-lanes is another matter. Now supposing you’d just been elected Mayor of Seattle, and found yourself in the exact same set of circumstances as Jennie Durkan. And very early on, well-reputed interest group- one among many- asked to meet with you in person over a sudden halt to a project they believed vital to the health of your city. They specified no minimum amount of time. Five minutes would’ve been enough to tell them what you’d suddenly found out about, and promised to tell your voters as much as you could, and how soon. And also thanked them for their welcome, and their important work to date. And then left the Deputy Mayor to explain in detail why their simple plan for Seattle’s most important street-space would not work. In other words, Mr. Mayor, this isn’t about policy. It’s about basic respect for people whose continued help you’d best be grateful for. In US history, trouble with impeachment is who’s the likely successor. So better to leave it as a look in your eye when you register as some incumbent’s opponent. But here’s the thought Transit’s present treatment brings to mind. “Shined On.” Kind sad that one went away right after the Korean War, along with Cat’s Paw(tm) heels and the Electroliner. Because what it meant was: Deep personal disrespect applied, polished and buffed to glare like a mirror. And rubbed in as if the kid expected a really big tip. Correct answer requires a work-boot with a steel toe for footwear. The scuffier, the better. A new Seattle incumbent Mayor’s most effective defense right now? Leave every Interest opposed to the CCC but, as with the Waterfront Streetcar too yellow to go public, on the Deputy Mayor’s calendar. Making him one less person who’s “got the goods on you” out for your job next election. Sound about right? David, thanks for your thought-provoking piece. About Mayor Durkan’s commitment to transit – SDOT’s well-publicized failures to fulfill the promises of the Move Seattle levy have delivered anti-infrastructure folks a priceless “we-told-you-so” story, and the Mayor has very good reason to stop in-trouble projects like CCC until organizational issues get fixed and the projects can be re-evaluated with realistic budget and schedule assumptions. About congestion pricing – agreed that it might be a regressive fee, but the commons IS running out of grass, regardless the financial status of the farmers. Roughly speaking, your egalitarian argument is also made to oppose road tolling. Do you agree with it there? That said, agreed that proceeds should mostly go to transit development. The Central City Connector shouldn’t be built if it’s too costly. IMO, being a “transit advocate” doesn’t mean “provide transit 24 hours no matter how little the ridership nor how much the cost”; it means providing transit to the low-income transit-dependent where and when it makes sense and to the rest – who either own a vehicle or could afford to – when it’s practical, ideally to/from popular destinations, which may differ on weekends from weekdays.